Product #46548 | SKU BAA821SA | 0.0 (no ratings yet) Thanks for your rating! 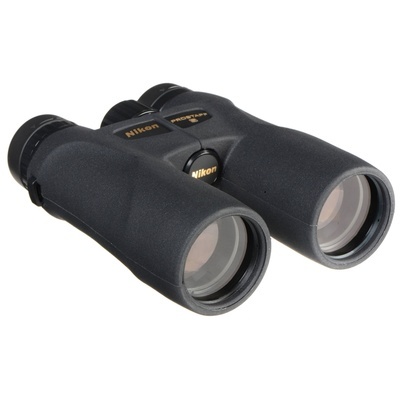 The 10x42 Prostaff 5 Binocular from Nikon combines a weather-sealed housing and fully multicoated optics to create a general purpose set of glasses for mid-range viewing tasks. This configuration of the Prostaff 5 features a 52° apparent viewing angle and 16 ft minimum focus distance, making the 10x42 ideal for nature enthusiasts and sports fans. Nikon's Eco-Glass optics are made of responsibly-sourced material that do not contain lead or arsenic. Fibreglass-infused polycarbonate allows the Prostaff 5 housing to be lightweight while remaining shock-resistant and durable. Additionally, the housing is nitrogen-filled for fogproof performance, and it is rubber armoured for slip-resistant handling. A 15mm eye relief and Turn-and-Slide eyecups with several click-stop positions enable comfortable viewing distances even when wearing eyeglasses.